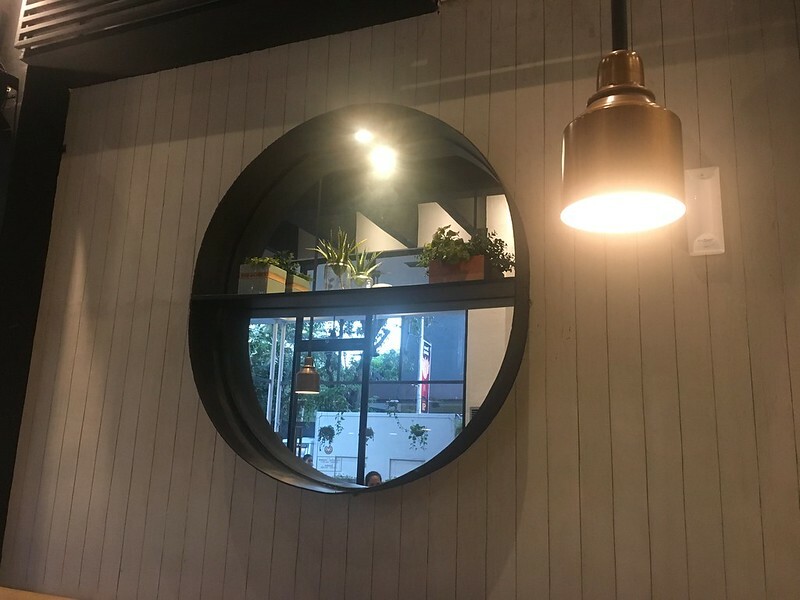 Hidden away in New Manila is a haven for lovers of coffee and comfort food. 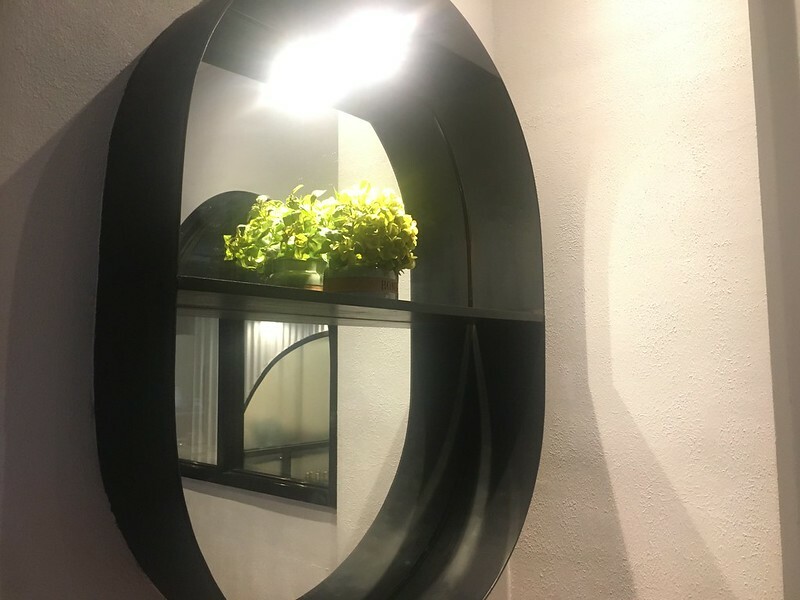 Renovated from one of the previously worn-down houses along Broadway Avenue, Little Owl Cafe is nestled among lush greenery. 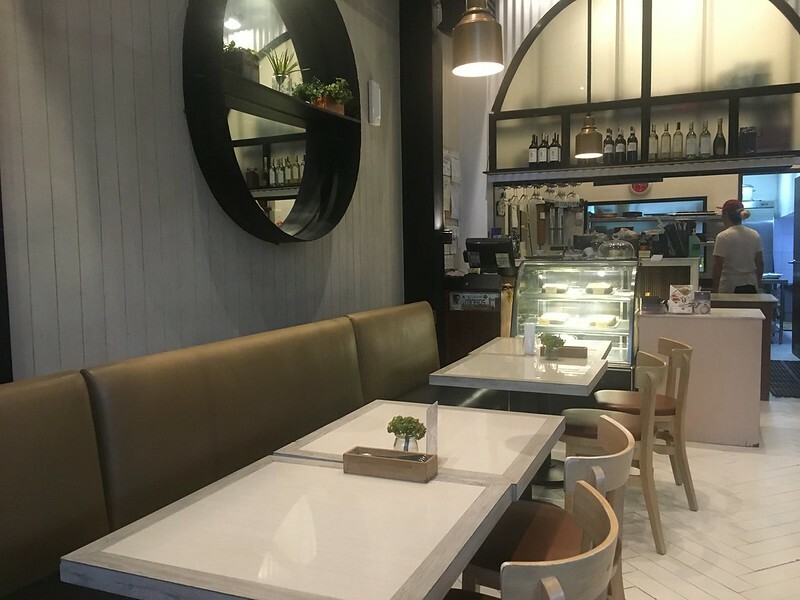 Started as a coffee shop but now a full service cafe, it serves food that features a fusion of Italian and Asian cuisines that professionals working in the area or families residing nearby can enjoy. Omelette Chorizo Rice (Php270). 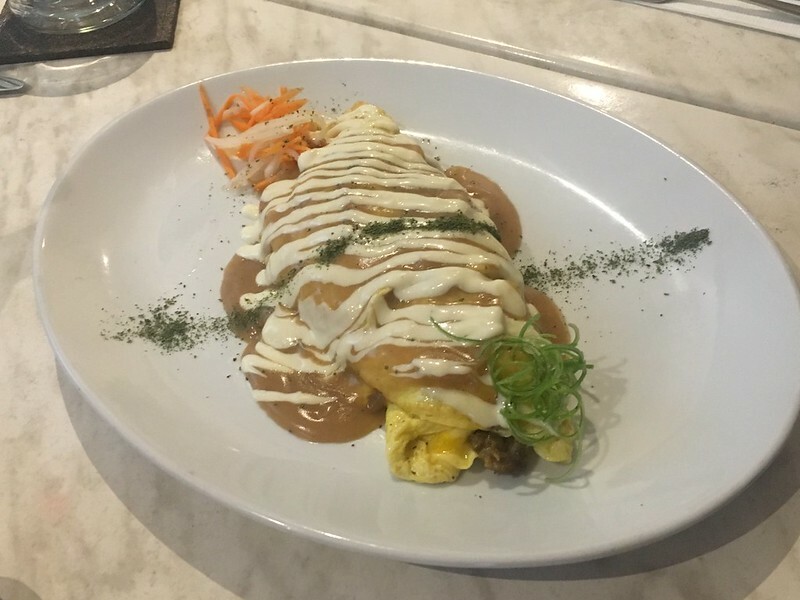 Part of the resto’s All-Day Breakfast Menu, it consists of homemade longganisa rice, delicately wrapped in a thin omelette and topped with onion gravy and aioli. 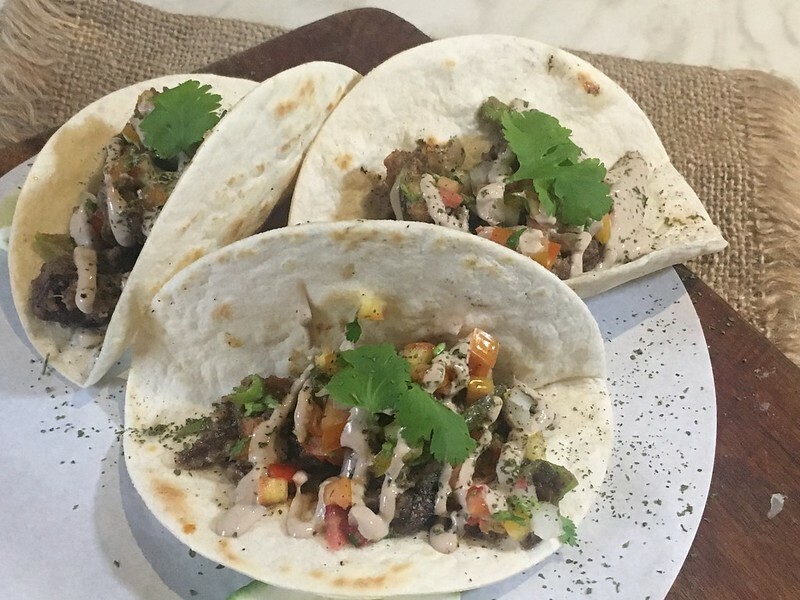 Sisig Tacos (Php210). Three pieces of soft-shell tacos topped with crispy sisig and a savory liver aioli sauce. A great start to the meal! 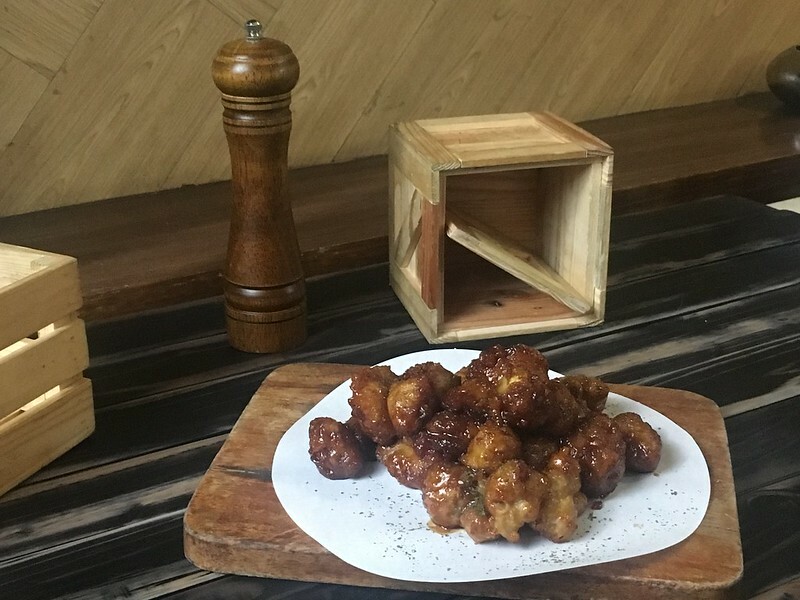 Glazed Cauliflower (Php210). Cauliflower covered in a sweet and spicy soy glaze then deep-fried to crispiness. A great way to get the kids to eat their veggies! Truffle Mushroom Pasta (Php350). 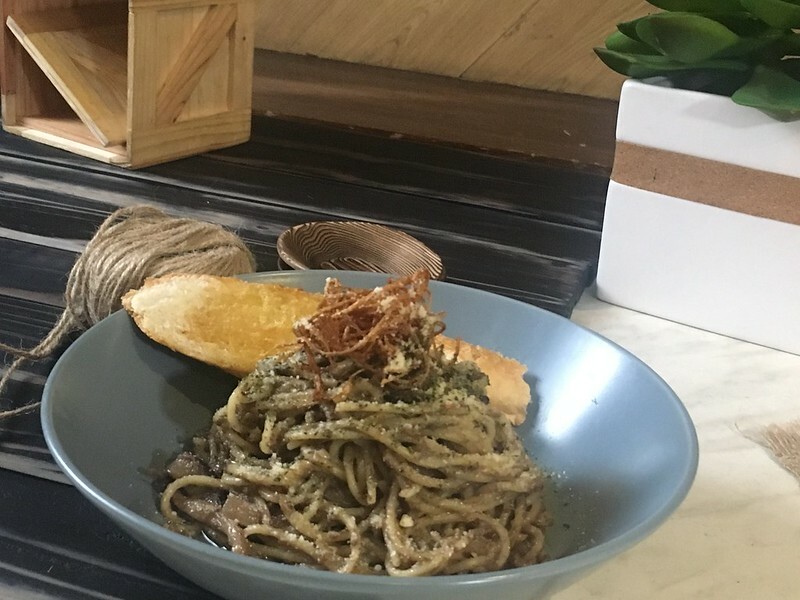 Al dente noodles tossed in a rich homemade mushroom sauce made with three different kinds of mushrooms – shiitake, enoki and shimeji – topped with fried enoki and drizzled with truffle oil. 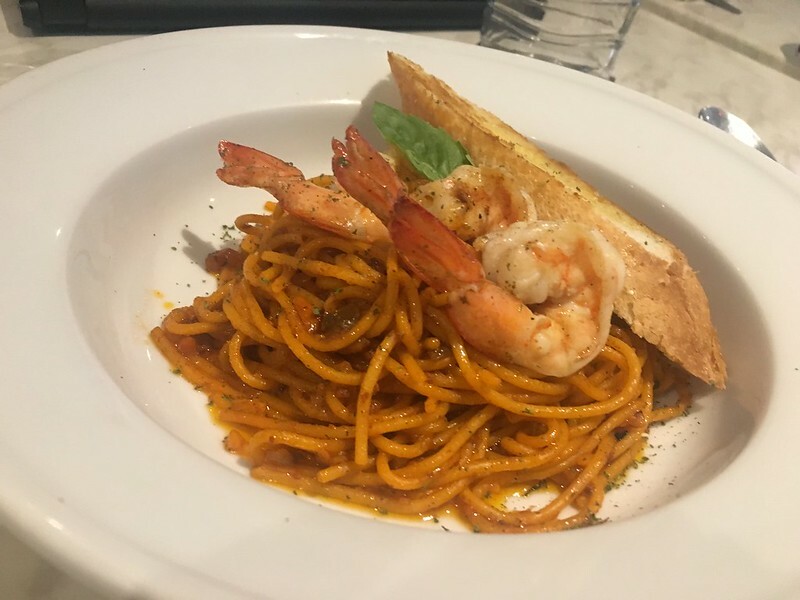 Shrimp & Aligue Pasta (Php330). Pasta noodles tossed in a creamy tomato sauce incorporating shrimp aligue and served with plump grilled shrimps. Beef Tapa & Cheese Sandwich (Php295). 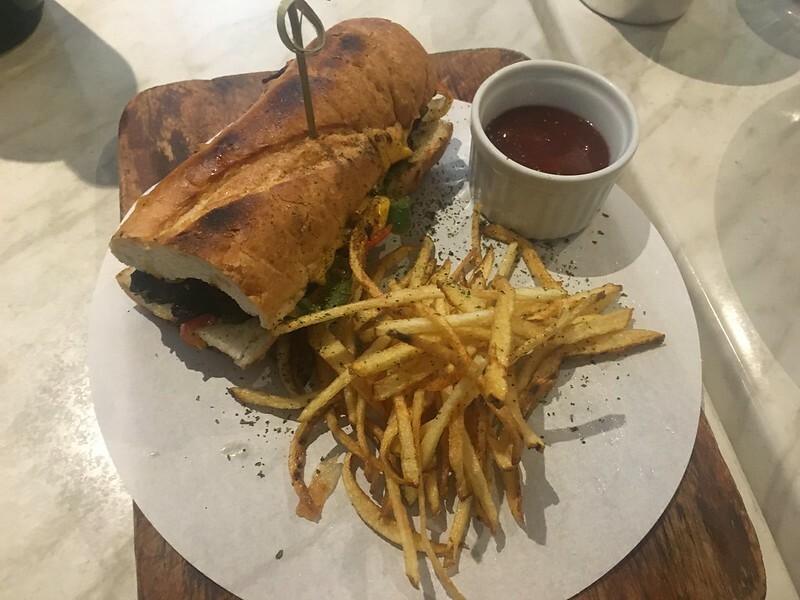 A Pinoy take on the Philly Cheesesteak which showcases savory slivers of beef tapa, it is accompanied by a hefty serving of crisp shoestring fries. 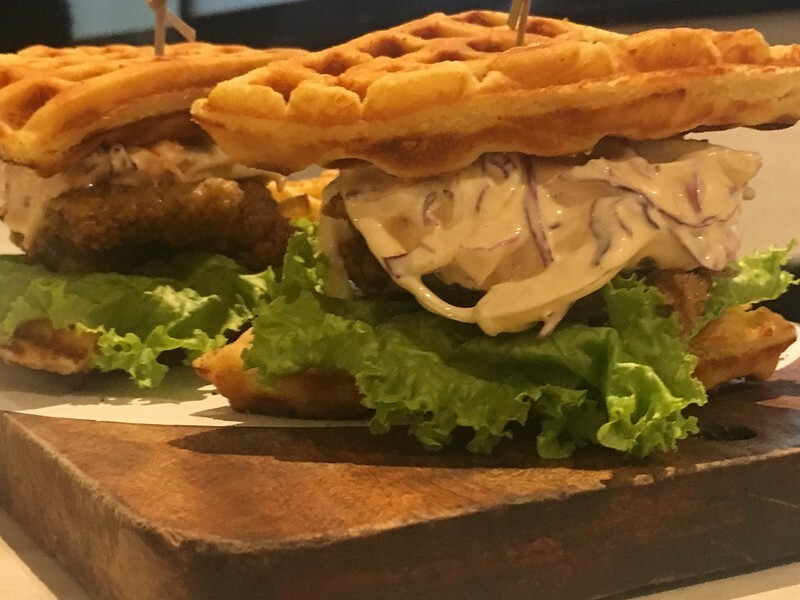 Chicken & Waffle (Php270). Chicken thighs covered in batter then fried to a crisp then served with sriracha coleslaw over cheddar waffles. 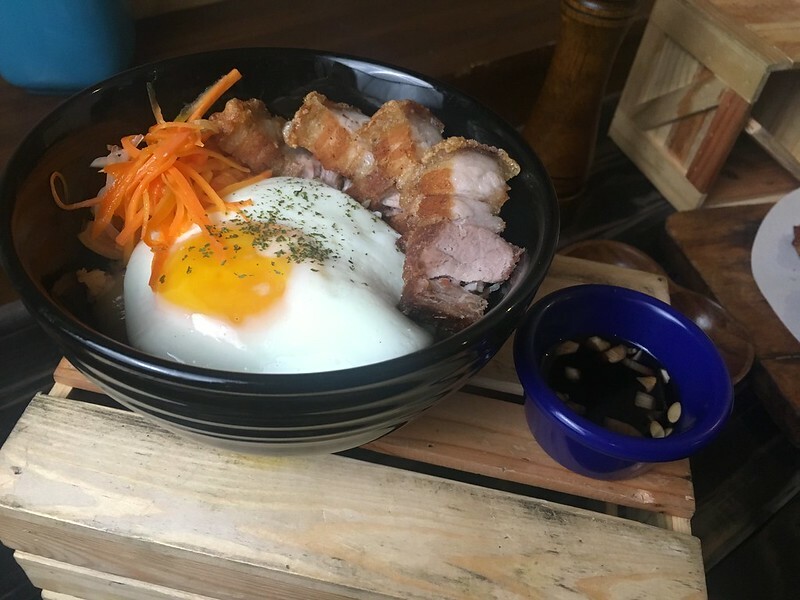 Lechon Kawali Bibimbap (Php320). The classic sweet-spicy Korean fried rice served with sauteed mushrooms and spinach accompanied by deep fried pork belly and fried egg. A great combination of Pinoy and Korean flavors! Chicken Satay (Php280). 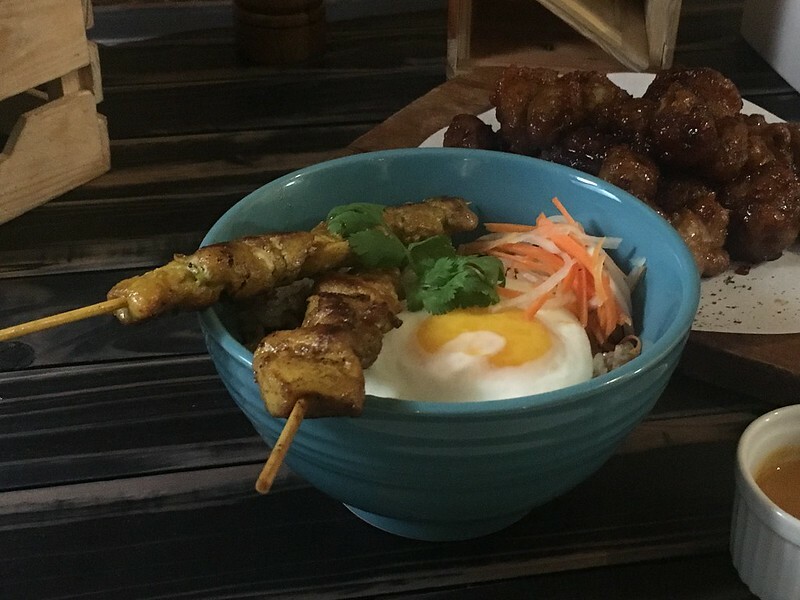 A bowl of Indonesian- inspired fried rice served with grilled chicken thigh and its trademark peanut sauce. 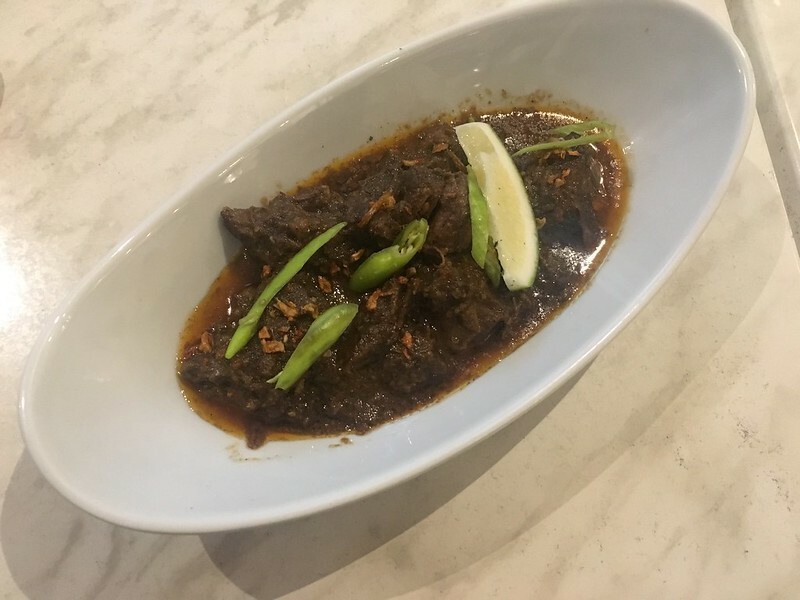 Beef Rendang (Php420). Tenderchuck slow-cooked in aromatic spices and coconut cream. A little too spicy for me but a sure winner for those who like their food with lots of kick! Kimchi Salmon Sinigang (Php420). 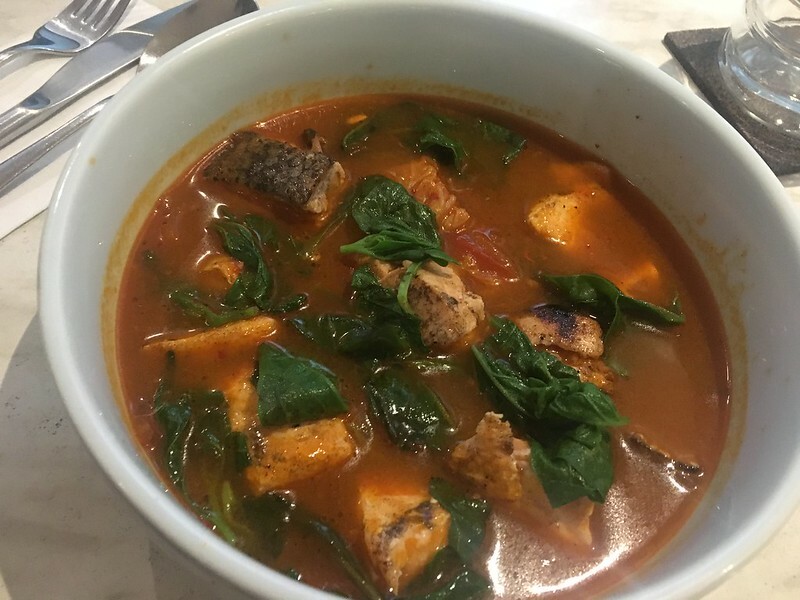 Salmon belly and loin seared then served in a spicy and sour soup. Iced Mocha (Php170). 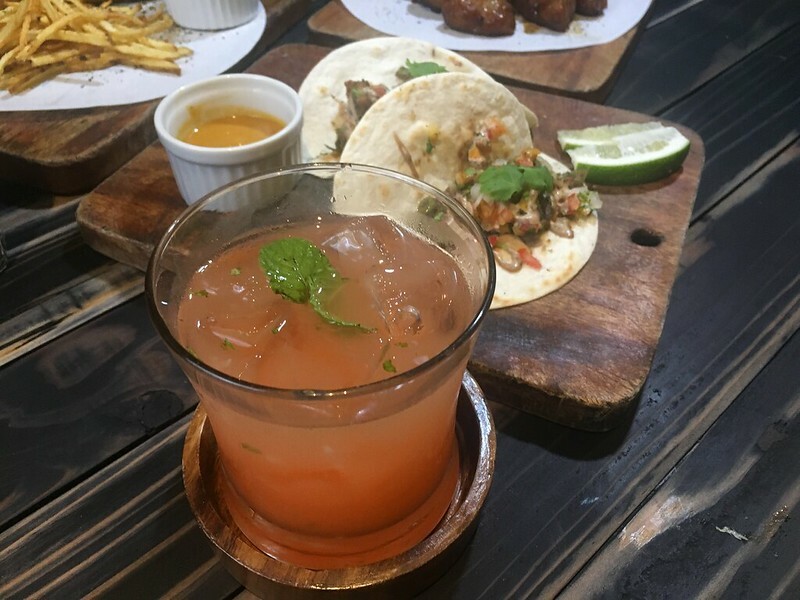 A rich yet refreshing blend of chocolate and coffee flavors, it is among the Toby’s Estate beverages served in this restaurant. Pink Owl (Php180). A fruity cocktail of vodka, lychee, watermelon and mint. A suitable drink to chase away the workday stress. 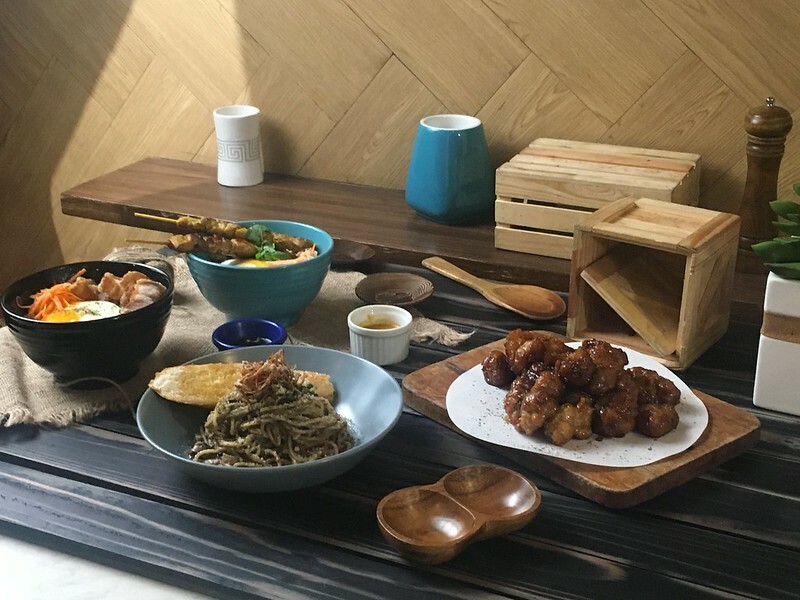 Little Owl Cafe’s food offerings provide its diners with an adventurous break from the everyday meals but with enough familiar flavors to make them appealing to those with more conservative tastebuds. 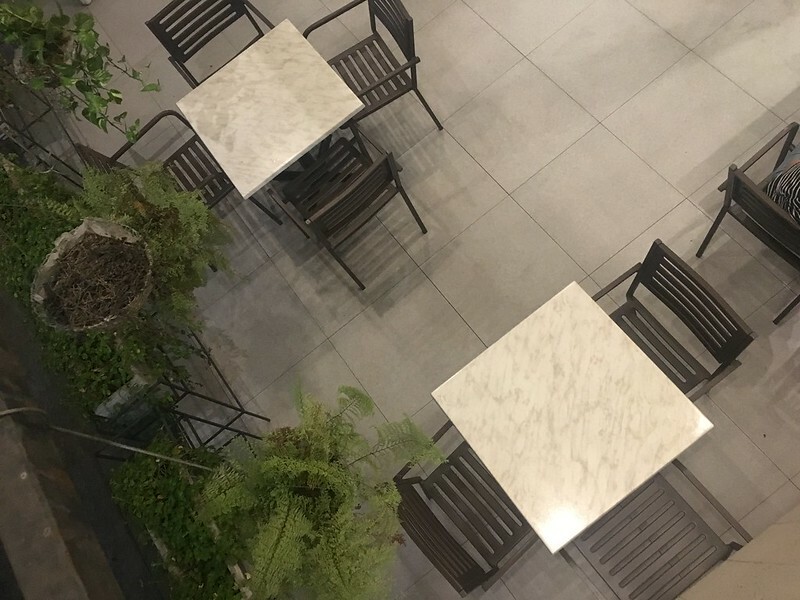 Its premises are well-appointed, tastefully furnished and prettily lit, great backgrounds for foodie shots and group photos. 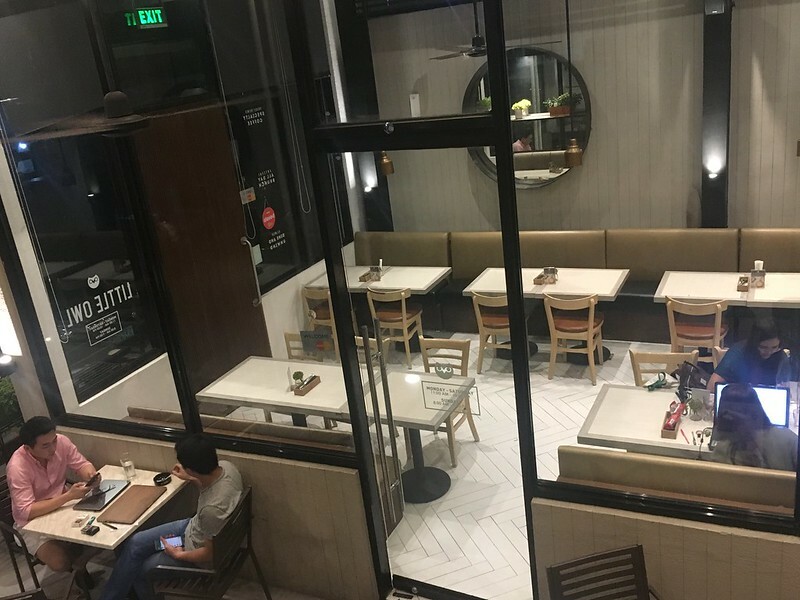 Since this resto is conveniently located a short distance from my workplace, I definitely can drop by again for dinner with friends after office hours. 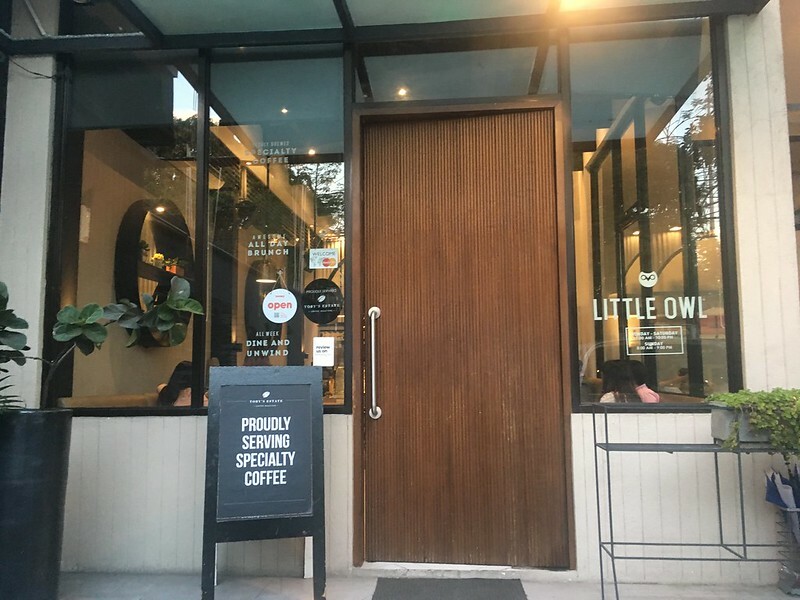 Little Owl Cafe is located at 65 Broadway Avenue, New Manila, Quezon City, open Mondays to Saturdays from 11am to 10pm and Sundays from 8am to 9pm. For inquiries, call + 63 917 8181468 or +63 2 5012036. 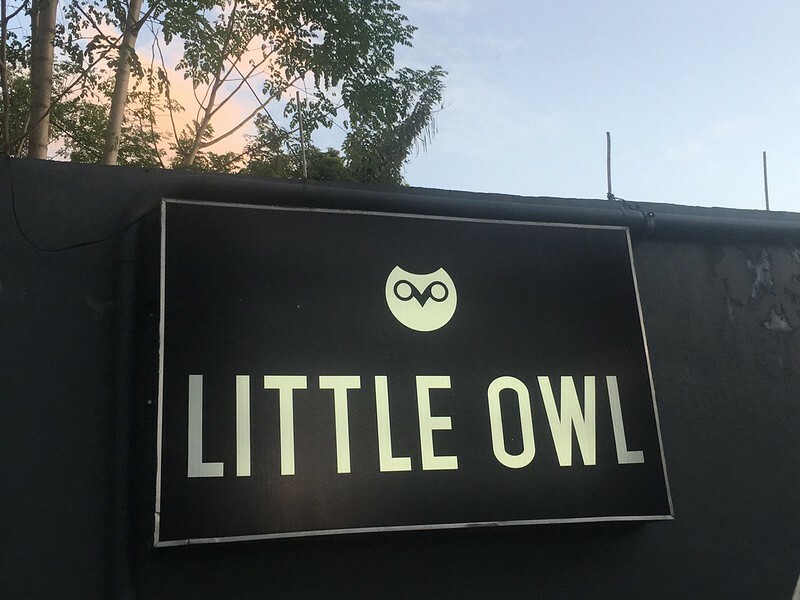 Little Owl also accepts bookings for special events such as weddings, birthdays, holiday parties, press conferences and more, with function rooms that can be reserved for a minimum consumable amount. whew! mukhang masarap nga dyan mamsh ah! 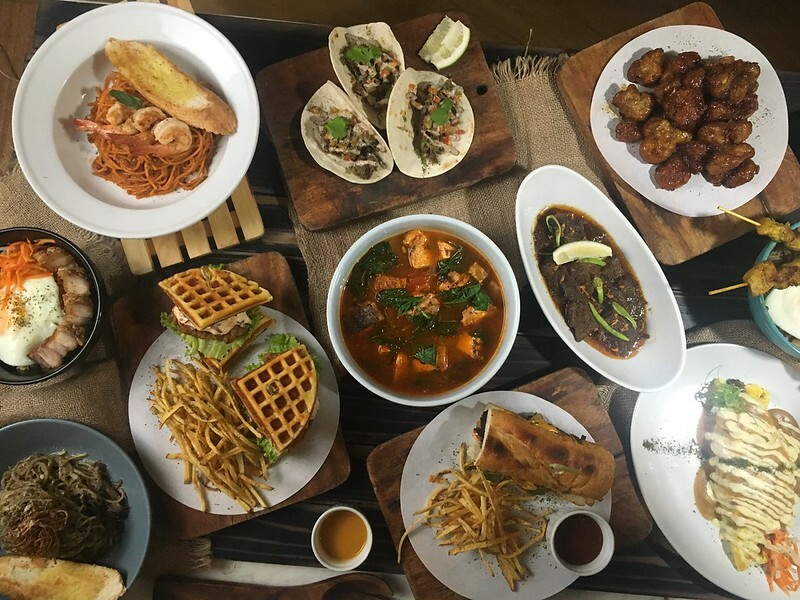 Mukhang masarap lahat! I must visit this soon!